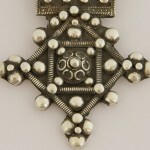 The Berbers wear only silver. It has something to do with silver being the preferred metal of the prophet. Archival pictures show Berber women completely laden with the most unbelievable silver adornment. Today of course, these images are fewer thanks to the skyrocketing price of silver, but still, jewellery continues to be important, not just for its decorative value. It has protective symbolism, it is the family’s bank, to be melted and traded in lean times, bought and remade in good. The jewellery a woman wears is a symbol of her family’s status and wealth. So, interestingly, the woman and not the man is the family financier plus showpiece and bearer of its reputation.